By combining this holistic approach clients lead healthier and happier lives and are taught how to make this lifestyle a part of their identity so they can maintain a more optimal level of health and fitness throughout forever more. Testimonials are curated by LEP Fitness and are not independently reviewed or verified. "Really lovely guy and great personal trainer! Knows exactly when to push you and when to stop! Would highly recommend training with Nick no matter what your fitness goal is. Every session has a variety of exercises that Nick has tailored to my desired fitness needs which keeps every session different, new and exciting! Since training with Nick I have seen a massive improvement in my fitness, body shape and my motivation to work out - very happy and look forward to even more results!" "Working with Nick has been great. He has helped me build my confidence and I have felt a massive improvement in my physical fitness. I couldn't ask for a better or more caring personal trainer." "Before coming to LEP Fitness and meeting Nick I never knew that I could be the sort of person who would want to do exercise and train to achieve the goals I want. Nick's relaxed but firm attitude to my fitness sessions motivates me to work hard and within weeks I am seeing results. Each session is tailored to benefit me and help me achieve my personal goals. The variety of exercises each time I train keeps me on my toes and interested. I have loved it so much that I will continue to work with Nick online whilst I go abroad for work and hopefully when I come back. If you are looking for a personal trainer book LEP Fitness I can guarantee you won't be disappointed." "We have been training with LEP Fitness for 4 months now. Nick is extremely entusiastic and knowledgable and we love the sessions. Our workout sessions are hard work but he makes them enjoyable and fun. As well as the awesome sessions Nick has taught us a lot about nutrition, exercise, and general wellbeing and the importance of supplements. We have gained so much from Nick, would thoroughly recommend LEP to anybody, thank you so much!" "Around 4 months ago, after a long period out of training and not in great physical condition, I decided to take the step and contact Nick at LEP Fitness after some great recommendations. Fast forward 4 months, and I have gone from 21% body fat to around 12%, shed near enough 2 stone and am far fitter, both physically and mentally. I've also become more organised and far more productive! I was fully aware, from my friends recommendations, that Nick was a good trainer, but what surprised me the most was what this journey would do for my mentality, productivity and my overall health. Nick is more than just a personal trainer and pays great attention to the mental side of health and fitness, recommending podcasts/books which he thinks may be beneficial and explaining things in thorough detail. He is always on hand to answer any queries I have and explains 'the why' in all that we do. This helps me to understand nutrition and fitness itself and apply in day to day life." 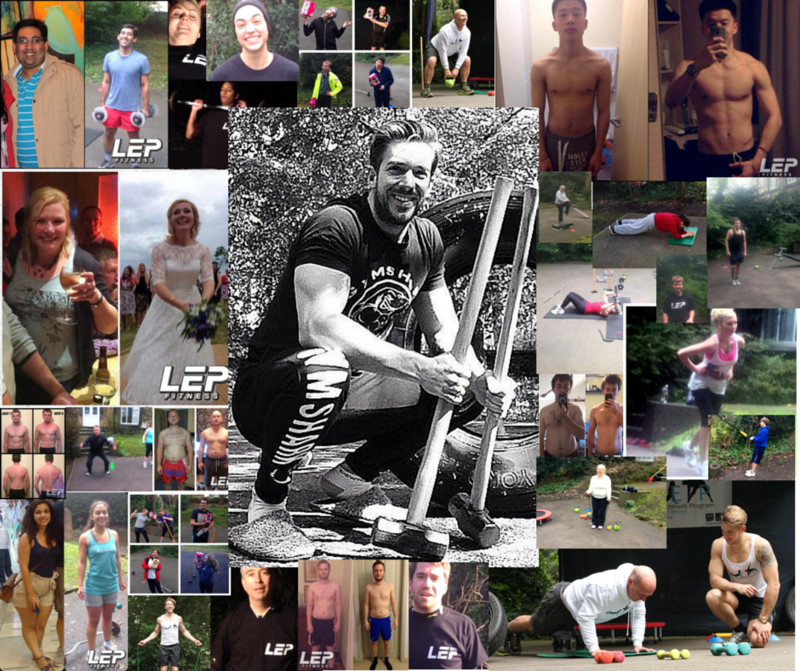 "My time at LEP Fitness has been the best investment I have made. Before I started with Nick I wasn't completely happy with how I looked and felt and I knew I needed someone to push me towards what i wanted and to give me guidance...that's what I got with LEP. I've lost 28lbs thanks to Nicks nutritional plan and gym workouts. I used to shy away from the gym as, like a lot of people, found it an intimidating place to be...surrounded by lots of people who knew what they were doing, which I didn't. When your coached by Nick he will encourage you all the way. Nick helped with everything, from the nutrition plans to the gym plans he created for me. You can tell he takes time to plan them to get the best out of you. He asks you how you have been getting on, what can he change, have you found anything difficult? Just shows how much he loves what he does and that he genuinely cares. to anyone reading this wondering whether to join....Do it!" "To describe nick simply as a personal trainer is like describing a Ferrari as just a car.....a HUGE understatement! Nick is truly somebody quite special. Not just in terms of his knowledge but his enthusiasm and genuine commitment to get the best from you. I would recommend Nick to anybody, be that somebody who has just started training but especially somebody who has trained for years. Even though I have personally trained for over 10 years, the fact he could show me subtle differences in body posture and hand grip to maximise my bench press is simply staggering - it still takes my breath away. Also, his diet plans are something out of this world. This guy can shake up your training for all the right reasons. And he's a top bloke who even help me with my business and gave me some unbelievable ideas. If you are serious about training - see him"